Last Thursday I reported about the preliminary hearing of 6 militaries in Honduras for having let Zelaya slip away from justice, by flying him to Costa Rica. The case was delayed by a 6 hour meeting of the entire Supreme Court. Since the proceedings are, unfortunately, not public, I did not know why. However, thanks to a blog from those who tried to stop the case, it is now in the open. A group of human rights NGOs in Honduras who are seemingly almost religiously convinced that the change of president on June 28th last year was a military coup, requested that the judge in the case – the president of the court none less – excuse himself. And not just him, but the entire Supreme Court of Justice. A reading of the request shows that it is not seriously meant. It is just a PR stunt. Starting the pleading by stating that you do not recognize the court’s authority, even accusing them of being coupsters, is hardly the wisest strategy if one is hoping to win support. So why did they do this legally meaningless stunt? Consider this: When the military leadership gets prosecuted, the argument for it being a coup falls apart. Therefore they have to try to paint the court as coupsters, them too, hoping that it will make the world ignore the case. It would be tragic for human rights in Honduras if those organizations only fought windmills. 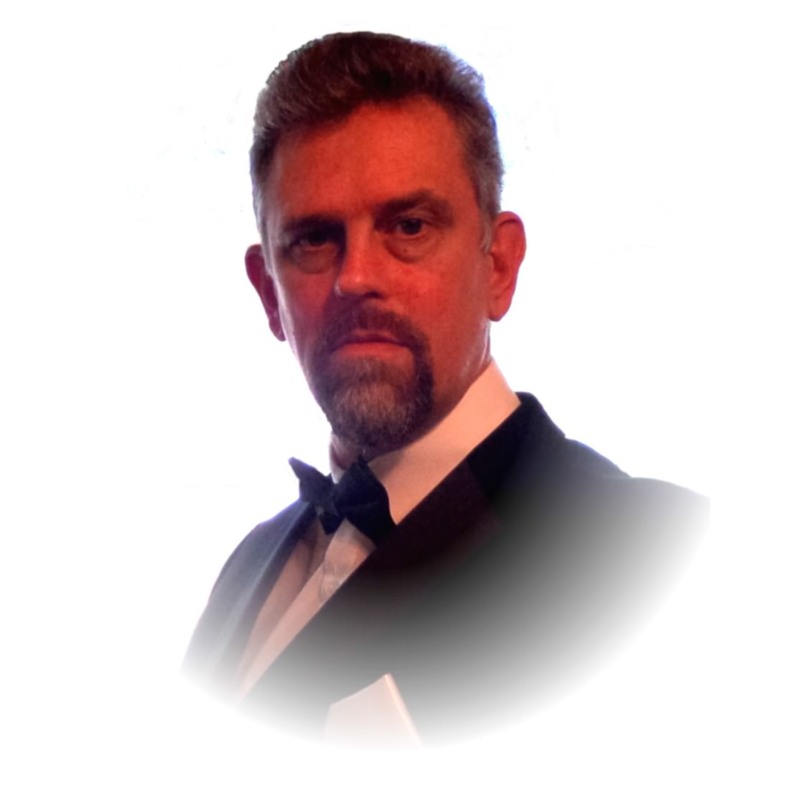 I am talking about CODEH, CIPRODEH, CDM, CPTRT, and others. They have already lost a significant part of their credibility among Hondurans for their intransigency. If they would start respecting the democratic institutions – remember that the Congress is elected by the people, and the Supreme Court is elected by elected representatives – then it would be possible for the state to cooperate with them in advancing the issues of human rights, women’s rights, and so on. But until such a time, they are doing a disfavor to all those whose rights are being violated, and who would need their assistance. They are also doing a disfavor to their foreign donors, e.g. the taxpayers of The Netherlands. The best thing that could happen is if a competent and impartial court could settle the question once and for all: Was it a coup d’état, or was it a constitutional replacement of president? Someone like the ICC for instance, the International Criminal Court. I suspect that they are looking into it right now, since they have received communication from the organizations I mentioned earlier about suspected human rights abuses. I hope that the prosecutor at ICC comes out soon with his result on the issue of whether it was a coup, so that everybody in Honduras can be on the same page again, legally speaking. The sooner this legal issue is settled the sooner reconciliation can be realized, and the sooner there can be an end to political crimes (which includes a lot of property damage in illegal demonstrations, something that in e.g. Sweden could give up to 4 years in prison for every single participant!). PS. The only institutional legal study I have seen so far concluded that it was a constitutional succession, and personally I have concluded the same thing after studying legal documents that are linked in some early posts on this blog (Honduras, Mera dokument från Honduras). The outgoing Honduran president Roberto Micheletti, whose government no country in the world is recognizing officially, is receiving honors during his last few weeks in office. Private sector organizations in both the capital, Tegucigalpa, and in the industrial center in northern Honduras, San Pedro Sula, have paid their tributes at well-attended events. He has even been called the first national hero of this century, comparing him to icons such as Fransisco Morazan and Lempira. At an event in San Pedro Sula Friday there were over a thousand persons present. Various private sector leaders praised the president – whose home town is within communing distance of the city – for his steadfastness in defending his country against unjustified pressure and under a situation of extreme economic hardship. It is worth recalling that before June 28, the deposed president and his accomplices plundered the coffins of the nation, and after June 28 the international community cut off all aid and all credits – and for a while even trade. At the same time, there were calls abroad for freezing the funds of Honduran companies and citizens. The private sector decided it was much safer to keep the money in their home country, and make it work for the government. This is a fundamental change, and I don’t think people outside Honduras have yet understood the full implications of this change of mentality. What has hampered development most of all is the lack of capital, because profits are being drained. The international community may have done Honduras a favour in disguise, and this is actually a rather common sentiment. Every crisis brings opportunities, and Honduras may never have had a better opportunity. President Roberto Micheletti received a statue showing him defending the nation while sticking to the Constitution. 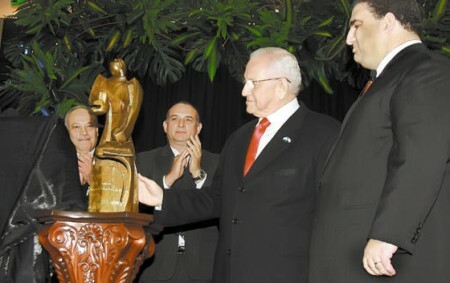 During the event in San Pedro Sula, Micheletti was given a statue showing him with one hand defending the nation, and with the other pointing to the Constitution – a document that he himself participated in creating as a member of the Constitutional Assembly. Roberto Micheletti some 30 years ago. The displays of affection for Micheletti go well beyond the ordinary for an outgoing president. Record numbers of citizens want to have their photos taken with him at every opportunity that is given. Nobody is accusing him of corruption, which is in itself quite remarkable. It is too early to tell if he will be seen as a national hero centuries from now, but quite a few seem to believe so today. PS. At the event they played a folklore dance tune from Brus Laguna, Gracias a Dios, Mosquitia, eastern Honduras, that has come to be associated with this presidency, Tap-Zap. The words are not translatable, as the language spoken there is a mixture of a number of languages from three continents.